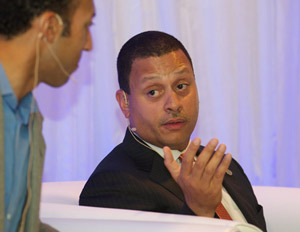 Blair Taylor, president & CEO of Â the Los Angeles Urban League, spoke before an audience of roughly 300 business, government, non-profit and academic leaders, sharing his thoughts on building blocks for tomorrow’s workforce. He told them about taking a delegation of students from Crenshaw High School to China to observe commerce and culture within the superpower.Â While in Beijing, the group visited one of the country’s top-ranked high schools, gaining an up-close view of its advanced level of instruction and dedication to academic excellence. 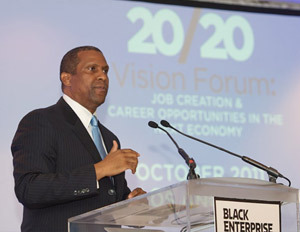 That message, one of continuous skills upgrading fused with unyielding persistence, was delivered by participants of our 20/20 Vision Forum: Job Creation and Career Opportunities in the Next Economy, one of a series of such events presented by BLACK ENTERPRISE in partnership with Walmart. Â The LA event, like one held in Washington, DC in early 2010 and another in New York this past June, was designed to bring together the best minds to conjure up constructive options to put a dent in short-term unemployment and propel long-term career advancement for African Americans. Keynote Speaker Tavis Smiley says that as individuals seek the path to employment and entrepreneurship to “define their mission.” He, however, took the opportunity to challenge the President on his vigilance to solve the jobs crisis. Others seek remedies to not only address Black unemployment but expand ranks of high-ranking officials. 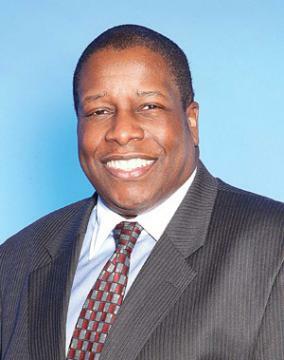 For example, BET founder Robert Johnson, who owns three BE 100s companies, recently proposed what he calls the “RLJ Rule,â€ calling for the 1,000 largest publicly traded companies to voluntarily consider a more diverse pool of qualified candidates when filling top-level job vacancies and contracting suppliers. His proposal is similar to the NFL’s “Rooney Rule,â€ a 2003 directive mandating pro teams to consider minority candidates for senior positions. To fill the power pipeline, Arnold Donald, president and CEO of the Executive Leadership Council, the pre-eminent organization of top-ranking African American corporate managers, Â announced last week a call to action for corporate America Â to increase the ranks of African Americans CEOs or C-Suiters by 500 and collective number of Black board members by 200 within the next five years.